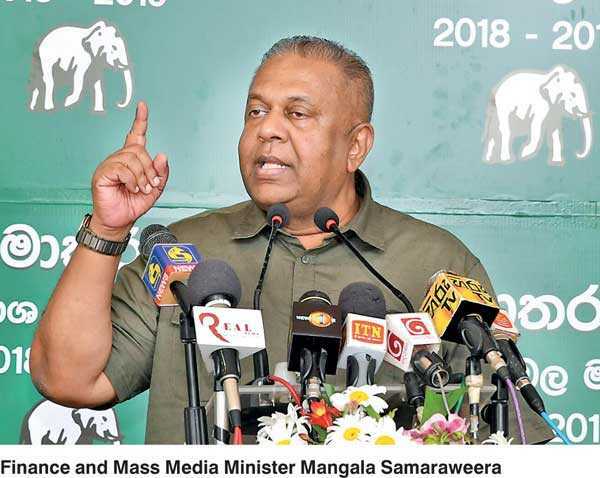 Finance and Mass Media Minister Mangala Samaraweera yesterday stated that the current government salvaged Sri Lanka from its status as a drop of blood on the world map and prevented former president Mahinda Rajapaksa from becoming an international criminal. The Minister pointed out that the ex-President now had the opportunity to visit the international community and even to criticise the Government thanks to the present government. He was addressing a meeting held under the patronage of Secretary General of the United National Party, Akila Viraj Kariyawasam to inaugurate the UNP Bala Mandalaya (electoral council) in the Matara electoral division yesterday. Speaking at the event, Minister Samaraweera said the party needed to prepare for several elections in 2019. Since these elections were just as important as the 2015 elections, the party members needed to work with dedication and commitment this time as well, he said. “We remember how the country was by December 2014. Our country was marked as a bloodstain on the world map. We were accused of violating human rights in the war. An international investigation was to be held even without our involvement,” the Minister recalled. “The new government elected in 2015 pointed out to the UN in New York and Geneva that the new government is ready to take measures against any human right violations and punish the culprits. The UN halted the international investigations on this government’s promise. This government paved the way for the former president to go abroad and boast. If not for this Government he would have been punished by an international court,” the Minister said. “Mahinda Rajapaksa was able to leave the country because of the trust placed in this government by the international community,” he said. “Mr. Mahinda Rajapaksa should light an oil lamp to Prime Minister Ranil Wickremesinghe’s picture. We stopped him from becoming an international criminal,” he added.